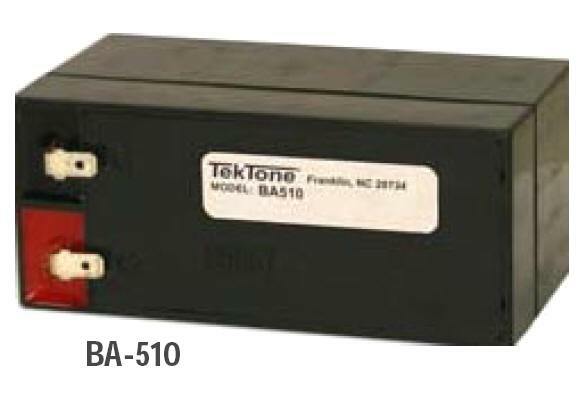 The Tek-CARE®500 BA510 (BA-510) Backup Battery provides uninterrupted, temporary 12 volt DC power to the NC511 Repeater or NC512 Locator in the event of primary power failure. Switch-over from primary power to the BA510 is automatic, as is the recharge of the system's batteries upon restoration of normal power. Backup power is supplied through the use of one sealed, lead-acid "gel-cell" battery, rated at 12 volts for at least 1.2 amp-hours. The battery is replaceable, with connections made via male quick-disconnect terminals. Mount the BA510 in an IH511 Waterproof Outdoor Housing to allow protected electrical connections. The backup battery shall be TekTone® BA510 or approved equal as supplied by LEE DAN®. The BA510 shall be a lead acid "gel cell" battery for maintenance-free operation and reliability. The BA510 shall be used as a temporary power source in the event of power outages and shall support TekTone® NC511 or NC512 component operations in the Tek-CARE®500 Wireless Emergency Call System. Operation of the BA510 Backup Battery shall be automatic in the event of power failure. Recharge of the BA510 batteries shall be automatic upon restoration of normal power to the system. Mounting shall be waterproof inside the IH511 Outdoor Housing.